I was kindly invited by Joseph Nussbaum to show at Gallery J, located on the Second Pride West sim at this year’s Second Pride Festival, which kicked off last night in SL. There is a lot to see over there and there will be a lot of different events and stuff, you can get the calendar of events here. Here are a few pictures of the gallery and my pieces of work on show there. There is lots of very nice work on display from various SL residents, so go check it out for yourself. So why do we have Second Pride Festival? Which is the international gathering of LGBT (Lesbian, Gay, Bi and Trans) people in the virtual world, and their friends and supporters. Or Pride at all across the world in RL. Lots of people who are not LGBT ask this. Or say stuff like ‘why isn’t there straight pride,’ or ‘why do you need to go around flaunting your sexuality,’ and so on. 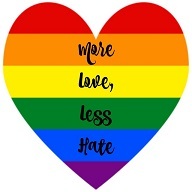 Pride brings the LBGT community together and allows us a safe place to have fun without judgement from others, it educates within our own community and in the wider community to help the battle for equality and acceptance, and gives LGBT people a voice. That’s just a few reasons, I’m not going to go on and on about it. If you are interested to know the history of Pride and more about it, there are many many articles on the web that you can read. You don’t have to be LGBT to support Pride either, there are ‘Straight against Hate’ groups and basically just being a nice human being and treating others as you would like to be treated goes a long way. Loving each other is the answer to probably every problem there is in this world. Tags: artwork, Equality, Festival, LGBT, Pride, Second Life, Second Pride, SL, Virtual photography. Bookmark the permalink.